Secretary-General Kofi Annan, who faces criticism over corruption in the agency's defunct oil-for-food program, enjoyed a standing ovation Wednesday from General Assembly members. The expression of support was planned. Earlier in the morning, diplomats said they wouldn't be surprised if members of the U.N. General Assembly delivered such a rare gesture. The world agency's show of support came a day after Annan shrugged off calls for his resignation, saying he has much work left to do. None of United Nations' 191 member states has demanded Annan step aside. Annan's second five-year term as the head of the United Nations runs through 2006. 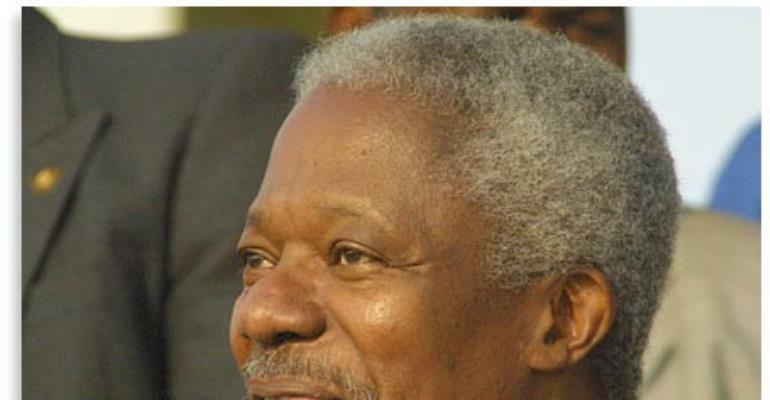 The ovation came after Annan endorsed a report titled "A More Secure World: Our Shared Responsibility," during which he called on the assembly to implement its recommendations. Annan said, "No country can afford to deal with today's threats alone, and no threat can be dealt with effectively unless other threats are addressed at the same time." Annan did not refer specifically to President's Bush's decision to invade Iraq without prior U.N. support. But he said, "If we do not act resolutely, and together, the threats described in the report can overwhelm us." He listed HIV/AIDS, nuclear proliferation, instances of genocide and terrorism among the biggest threats facing the world community, and urged the member states "to make 2005 the year of change at the United Nations." Furthermore; an interesting article was forwarded to Mr. CNN entitled; Ten Things Progressives Should Know About the United Nations Oil-for-Food Scandal by Michael Pan. Our worldwide audience is encouraged to read and acquaint themselves with the UN Oil for food program. In the wake of revelations about corruption in the UN oil-for-food program, right-wing columnists and lawmakers are calling for the resignation of United Nations Secretary-General Kofi Annan. Their arguments, however, ignore the facts. The United Nations is not an independent body, but the sum of its members - accountability must rest with individual member states as much as with the organization itself. At a time when the United States is trying to forge a global coalition against terrorism and garner more international support in Iraq, the United States should be trying to fix the United Nations system, rather than destroy it. Ten Things Progressives Should Know About the United Nations Oil-for-Food Scandal. 1. The program was poorly planned and managed. Set up in 1996, the United Nations oil-for-food program allowed the Iraqi government to sell oil to pay for food, infrastructure, medicine and humanitarian goods. The program was badly set-up and poorly managed, allowing Hussein's regime to embezzle millions of dollars. According to a General Accounting Office report, Saddam embezzled $4.4 billion through pricing irregularities. By the Senate subcommittee's higher count, Iraq got almost two-thirds of some $21 billion through the illicit trade deals or smuggling - most in deals made with governments before the program even began. 2. The program fed Iraqis and kept UN sanctions in place. The United States and the United Kingdom, as principal proponents of sanctions, voted for the creation of the program to address humanitarian and political concerns. As a result, Iraq's chemical, biological and nuclear weapons programs disintegrated, its conventional military forces crumbled, and the health of the civilian population improved. Under the program, millions of Iraqis were fed, child malnutrition and mortality went down, and access to electricity and clean water increased. Since the end of the program, malnutrition throughout the country has skyrocketed to the highest level in decades. 3. None of the money involved came from American taxpayers. Oil-for-food allowed the Iraqi government to sell Iraqi oil to pay for food, infrastructure, medicine and humanitarian goods. No U.S. money was involved. The United States government, which took over responsibility for Iraqi oil revenues following the invasion, failed to properly manage the newly-created account, known as the Development Fund for Iraq. As a result, according to government audits, the United States has failed to account for $8.8 billion in Iraqi oil money. Former Coalition Provisional Administrator Paul Bremer has refused to comment on where the money went. 4. The UN's independent investigator, Paul Volcker, is no pushover. The United Nations Security Council has authorized the creation of an independent panel chaired by Paul Volcker to thoroughly examine the allegations. Volcker worked in the United States government for almost 30 years, culminating in two terms as Chairman of the Board of Governors of the Federal Reserve System from 1979-1987. He divided the earlier stages of his career between the Federal Reserve Bank of New York, the Treasury Department, and the Chase Manhattan Bank. In 2003, he headed a private Commission on the Public Service recommending a sweeping overhaul of the organization and personnel practices of the federal government. 5. The Bush administration dropped the ball (dozens of times). The United Nations Security Council was responsible for oversight of the program. Specifically, it was the role of a Security Council subcommittee to monitor all contracts awarded under the Oil-for-Food Program. The United States had a representative on that committee during the entire duration of the Oil-for-Food Program, yet failed to blow the whistle. UN administrators identified at least 70 cases for potential over-pricing of oil between 2001 and 2002. None of these cases were held up for pricing issues by the UN Security Council, where Ambassador John Negroponte represented the United States, and most were later approved. 6. The United States failed to crack down on Jordan, Turkey, and Syria. According to the Administration's chief weapons inspector in Iraq, Saddam generated some $3 billion in schemes to subvert the program and $7.5 billion in direct deals with governments. The main routes for these illicit transactions were deals negotiated with neighboring countries, notably Jordan, Syria and Turkey (most negotiated before oil-for-food began). The United States explicitly condoned Iraq's deals with Jordan and Turkey, and was unable to persuade Syria to stop buying Iraqi oil outside of the oil-for-food program, allowing the country to become a major supplier of military goods to Iraq. 7. The Bush administration is not cooperating with the UN investigation. In an interview last month (11/23), Volcker indicated that the Bush administration was failing to cooperate with his investigation: "Look, we have problems with the American government... I can t say that the American government has been eager, or officials of the American government have been particularly eager in some cases.... I'm talking about the executive branch." Volker added that American companies were involved in the scandal, mostly through buying illicit Iraqi oil in the secondary market and posed the question, "to the extent the United States knew what was going on in some of these areas, why didn't they do more about it?" 8. Senator Norm Coleman is a headline-chasing opportunist. The oil-for-food story isn't new; it's been widely reported in the press for months now. Why the flurry of activity? As Coleman's hometown paper puts it, "Good old Norm; it appears there's nothing he won't do for a headline." The ranking Democrat on Coleman's Committee, Senator Carl Levin of Michigan, quickly distanced himself from Coleman, saying there was no justification for calling on Annan to resign. And the Bush Administration, including the President himself, has refused to support Coleman's irresponsible attacks on the Secretary-General. 9. There is no proof that UN Secretary-General Kofi Annan has done anything wrong. There is no proof that Annan, who won a Nobel Peace Price in 2001, ever had anything to do with, or any specific knowledge about, any of the specific deals, including those involving his son, made in the oil-for-food program. According to Senator Carl Levin, "There is no evidence that our subcommittee has seen that shows any impropriety on the part of Kofi Annan. That's what it comes down to." Once the scandal surfaced, Annan appointed former Fed chairman Paul Volcker to thoroughly investigate the matter. Volcker's report is still a work in progress. Until the facts are known, calls for Annan's resignation are premature. 10. Member states have a responsibility to take action. While the Volcker investigation has full access to UN documents, records, and personnel, it does not have the ability to subpoena witnesses or indict individuals. This power is reserved for member states only. There are charges that Benon Sevan, head of the program, and other UN officials received oil allotments from Iraq that amounted to bribes. If found to be true, member states including; the United States, must hold them accountable under national laws. Ghana's favorite son, Busumuru Kofi Annan, the UN Secretary General's "ears must been burning" ( "Naso ayeshe paa" ) now that he has been in the news of late as a result of the United Nations Oil-For Food Scandal. His son Kojo Annan's name has come up as receiving some "kick backs" but there is an on-going investigation and we are not going to speculate. A US Senator by the name Coleman desperate for attention is leading a call for our brother's resignation but we would say "not so fast". Some Senators think differently which includes Senator John MCcain. Even US President "Dubya" Bush is not going to that route. It would be a travesty of justice if that happens. Ghanaians all over the world know our brother is an honest gentleman, a model for success, peace and goodwill. Many a Ghanaian in the diaspora have not met Kofi Annan as they do not often see him in our community as a result of his position; some who have met him say he has a great personality. We would support our brother all the way because when it is all said and done, Ghana would be the focus of disgrace and the international media would have a story to sensationalize and haunt us forever.